When it comes to the various parts that make up your vehicle, you understandably may not pay as much attention to the tires. But, as it turns out, those four cylindrical objects do more than help get you from Point A to Point B — they’re also a vital part of your car that keeps you safe. In other words, they need to be well-maintained. Check out the following guide that will teach you everything you ever wanted to know about tires, from how often they should be replaced to how to properly care for them. Are All Tires Created Equally? Step inside a tire shop or check out the selection on any tire retailer website and one thing is immediately clear: There’s usually a huge selection of tires from which to choose. Of course, this seems to make sense; after all, a tiny hatchback will require different-sized tires compared to an off-road pickup. Indeed, different tire brands all have various features to offer drivers. For example, TireBuyer.com stocks a variety of Nitto tires, including the Terra Grappler, which can serve as a great all-around tire for a truck or SUV. Looking for tires that can grip sandy or rocky terrain with ease while still offering a comfortable ride? Then the Terra Grappler is right for you. But if there’s one drawback to Nitto tires, it’s that they’re best served for owners of trucks and SUVs, as well as luxury and sports cars. No worries, though. If you drive a sedan, hatchback or minivan and need a set of new tires, you can definitely find a make and model on TireBuyer.com that will work well for your vehicle. How Often Should Tires be Replaced? At least once a month and/or prior to leaving for a road trip, you should make it a point to check your tires’ tread depth. According to Consumer Reports, this is an easy process that involves using a quarter. Simply insert the coin upside down into the grooves of your tires. If you can’t see the top of George Washington’s head, then your treads are still in great shape. However, if Washington’s head is fully visible or flush with tread, you have about 4/32nds of an inch of tread remaining, which means it’s time to start shopping for new tires. As for when you should replace your tires, a lot depends on the quality of the tires themselves, as well as your driving frequency and area road and weather conditions. Much like any product or service, the prices for a set of new tires will vary depending on the make, model and brand. Typically, however, the cost to replace four tires ranges from $400 to $1,800. 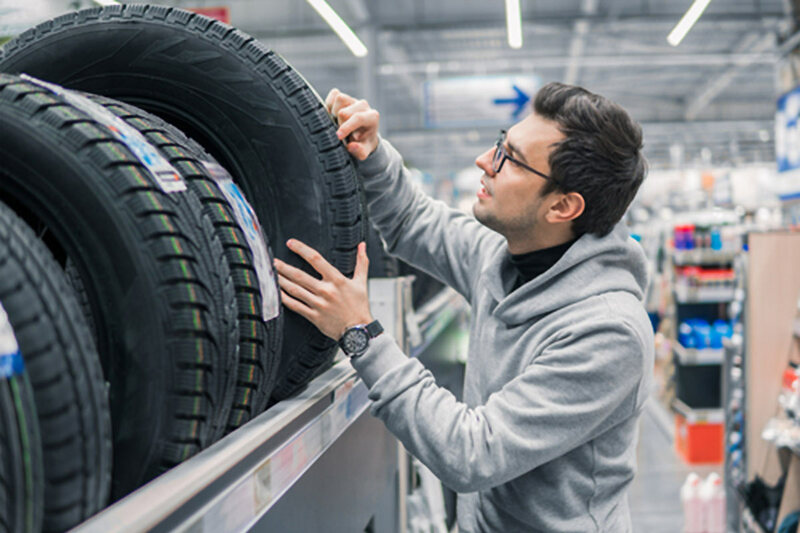 Some tire retailers will offer a discount if you buy two or four tires at once, so it’s worth watching for online and in-store sales. And as you might expect, higher quality and larger tires will cost you more. For instance, all-season tires that can handle a variety of road and weather conditions range between $50 and $200 a tire, whereas high-performance tires for sports cars range from $100 to $1,400 a pop. What are Some Other Tire Tips to Consider? In addition to checking the treads, experts suggest regularly monitoring the air pressure of your tires. At least once a month, use a tire pressure gauge to see if your tires are properly inflated. However, you should do this when the tires are cool, so first thing in the morning is usually a good time. You should also regularly perform a visual scan of each tire, looking for damage from things like nails and broken glass, as well as any cracks or bulges that require an immediate trip to the tire shop. Tires are definitely not a “put-them-on-and-forget-them” type of product. Thus, by understanding the differences between different tire brands and taking good care of your set, your tires should lead a long life and safely get you and your family anywhere you want to go.